Hockey’s Three Stars of Comedy is a monthly feature that will recognize the three NHL personalities from around the league who produced the most comedic fodder for fans. It will appear every month, unlike Toronto Maple Leafs home wins. I remember one summer when I was 10 or 11 years old, I went to baseball camp. On the first day, the instructor read my name wrong on the list and called me by my middle name. Rather than correct him, I just meekly went with it and spent the next two weeks trying to remember that I had to answer to “Kevin.” It’s a cute story, because I was a little kid and not a fully grown professional athlete like, say, Nicklas Grossman. The veteran defenseman had a similar experience, except it lasted for his entire NHL career right up until a few weeks ago. That’s when he finally got around to informing the Flyers that “Nicklas Grossman” didn’t actually exist. His last name is Grossmann, with an extra “n.” The NHL had had it wrong his whole career, and he’d never bothered to tell anyone. In the end, the Flyers corrected the spelling on the back of his jersey. Which was probably a better solution than my suggestion of leaving his name as it was and just adding a red squiggly line underneath. The Erie Otters play in the OHL, a Canadian junior league. Normally, they have two goalies. At the start of their March 4 game against the Niagara IceDogs, however, they had only one, because the regular starter was hurt. Two minutes later, after a scary goal mouth collision, they had zero. So what do you do when you’re in the middle of a game and nobody on your roster knows how to play goal? Well, if you’re Brian Burke you shrug your shoulders and call it business as usual. But if you’re the Otters, you ask around the dressing room and see if anyone wants to give it a try. And as it turns out, someone did. Connor Crisp, a 17-year-old center who had been out all season with a shoulder injury and hadn’t played goal in organized hockey since he was 5, volunteered to suit up and play the final 58 minutes. And that set the stage for one of those wonderful sports stories in which the plucky underdog stuns everyone by playing the game of his life to earn a miracle victory. So it’s too bad that didn’t happen. Crisp got shelled, giving up 13 goals. But it didn’t matter. At the end of the game, he received a standing ovation, was named the first star, and had the opposing players lining up to shake his hand. The whole thing was fantastic. In fact, the only reason Crisp isn’t the first star is that this feature is about the NHL and — in the very strictest technical sense — neither Crisp nor the Otters play in the NHL. Oh, attention to detail, you ruin everything. Let’s get this out of the way first: There’s a growing portion of the hockey community that thinks that fighting is no laughing matter. It might be far more dangerous than we’d always believed, and the enforcers who frequently drop the gloves seem to be taking on significant risk that can make their bouts impossible to enjoy for many. But what if instead of hulking enforcers, it’s skinny guys who have no idea what they’re doing? Can we laugh then? I think we can. And on March 17, the Maple Leafs and Senators tried their best to prove me right. I’m not making fun of that strategy, since it’s also the one I use. But the comedy part came after the scrap, with an embarrassed Gonchar laughing at himself in the penalty box while bemused teammate Erik Karlsson mocked him from the ice and then the bench. Rule of thumb: When Erik Karlsson is making fun of how tough you are, you are not tough. Not to be outdone, Maple Leafs center Mikhail Grabovski decided to get in on the act. Now there are two things you need to know about Grabovski. First, he had never in his life had an NHL fight. And second, as Leaf fans have come to understand, he’s sort of a crazy person. Not “actually dangerous” crazy. More like “why is he stabbing that pineapple?” crazy. Put it this way: You get the feeling that Grabovski has a lot of conversations that end with the other person backing away slowly while trying not to break eye contact too quickly. So who did Grabovski decide to face in his first-ever fight? Senators enforcer Chris Neil, of course. 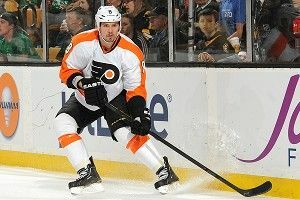 (Neil outweighs him by more than 30 pounds and has been one of the NHL’s leaders in fighting majors for more than a decade.) Needless to say, Grabovski won. Never mess with a pineapple-stabber. I don’t know you, so I don’t know what the most embarrassing moment of your life was, but I’m going to make some assumptions. It likely didn’t happen in front of 20,000 people. It almost definitely didn’t happen on live television. There is a chance it involved you winding up face-down on the floor while everyone pointed and laughed at you, but that probably wasn’t immediately followed by somebody immediately wailing away on a goal horn to call attention to it. In the big list of life’s least enjoyable moments, falling flat on your face in a shootout attempt has got to be right up there with, I don’t know, getting hit by a car driven by an 80-year-old woman while you’re minding your own business in a doctor’s office. Which, by the way, also recently happened to Devin Setoguchi. And you think you’ve had a rough year.